An increasing number of car manufacturers have begun taking consumer fuel needs into account. It is not uncommon to find a large number of vehicle models with Continuously Variable Transmissions (CVT) as they provide better gas mileage than automatic transmissions. CVTs are a kind of automatic gear transmission that allows your car to seamlessly and continuously change through different gear ratios. You can find CVTs in car models such as Nissan, Subaru, Toyota, and Audi. CVTs are also used in power tools such as drill presses and other smaller automobiles such as snowmobiles, and golf carts. The low manufacturing cost of CVTs makes them a better alternative to automatic transmissions. What’s the difference between a manual, automatic and continuously variable transmissions? The first transmissions to be used in vehicles were standard or manual transmissions. Commonly known as stick shifts, these transmissions allowed the driver to manually shift through gears while pushing down the clutch. With manual cars the clutch connects and transmits power from the engine to the drive axle and wheels, coming to a complete stop while the clutch still engaged will result in the engine dropping to its minimum speed and stalling. The clutch is what separates the flywheel from the transmission, proper use of the clutch will allow the engine to continue working even if the wheels have come to a complete stop, taking care of the stalling problem. Despite this drawback, many people feel that manual cars are still a better option in comparison to automatic cars. Automatic transmissions shift gears automatically, this allows a driver to either speed up or slows down by merely stepping on the gas or the break respectively. Though they are easy to use they are notoriously known for wasting engine power and use more gas than their manual counterparts. 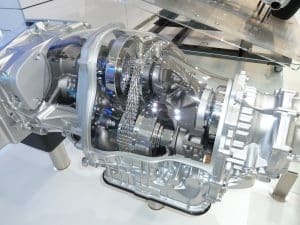 Vehicles using automatic transmissions have torque converters instead of a clutch which removes the direct connection between the engines and drive axles. This eliminates the risk of stalling that stick-shift vehicle owner’s face. A CVT is a more complex and computerized version of the automatic transmission that provides the driver with the same fuel economy as a manual transmission. The CVT, unlike its predecessors, uses belts to continuously adjust the gear ratio making the car run more efficiently. A basic CVT uses two cone-shaped pulleys and a steel belt, a hydraulic cylinder controls the diameter between the two pulleys allowing the steel belt to transmit power between the two pulleys, adjusting the overall gear ratio continuously. Its computerized transmission is its biggest perk enabling the engine to maintain an RPM speed at the point that it produces the most power. This increases car efficiency and offers the car owner a 6 percent better gas mileage than an automatic transmission. Compact: A CVT transmission does not have physical gears like automatic and manual transmissions; it uses a belt and pulley system to steadily shift through continuous gear ratios. The design makes it light and compact and suitable for smaller bodied vehicles. Fuel efficiency: A CVT can recover and store energy which allows it to accelerate faster while conserving engine power. The engine does not end up working harder at higher speeds and reduces fuel consumption. Much like its manual counterpart, a CVT is light in weight because it has fewer moving parts which also plays a role in reducing the gas an engine consumes. Safer driving: A CVT vehicle allows its driver to concentrate on the road while driving without worrying about properly working the clutch and while manually shifting through gears. It is faster than an automatic transmission. Car engines use revolutions per minute (RPM) to operate, CVTs come equipped with more efficient RPMs than automatic transmissions which allows the driver to shift gears without losing speed. It is smooth and easily adaptable to different road conditions. Depending on the carload both manual and automatic transmissions will struggle up a steep hill, a CVT will find and maintain the right RPM speed that produces the most power. Unless there is an underlying mechanical problem, a CVT vehicle will rarely stall. You can, therefore, drive with the confidence that your car will not unexpectedly stall. It may seem slower than an automatic transmission vehicle. A CVT accelerates at a constant speed, and as a result, drivers don’t feel the same jerk, an AT provides when shifting between low to high gears. In some instance, drivers go ahead to accelerate more because they do not feel the smooth acceleration. A CVT is more costly to maintain than a standard transmission vehicle. The cost of replacing individual components to a CVT is high. Unlike the AT, the CVT does not have a long life span because it uses friction to transmit power accelerating the wear and tear of belts and parts. This attribute makes continual repair and maintenance unavoidable. Finding a mechanic that has the technical know-how to repair one is difficult which drives up maintenance costs. It is very different from an automatic transmission. For most manual and AT vehicle users, noises are usually a cause for concern as they may be indicative of a mechanical problem. However, in a CVT changes in engine speed is usually accompanied by a noise that can be compared to a failing transmission. This may cause an AT veteran user to haul their vehicle into the repair shop unnecessarily. CVT vehicles are becoming increasingly popular not only due to low manufacturing costs but also because its pros outweigh its cons. They are faster than other transmissions, and their fuel-saving attributes make it the best choice of vehicle for city folk. The fact that they are still an automatic transmission makes learning to drive them easier and less manually restrictive. CVTs offer drivers a relatively more comfortable and smooth driving experience, and most of its drawbacks are attributed to the fact that it provides a different driving experience to manual and automatic transmission vehicles making them hard to get used to.